On the topic of u-pick from yesterday . . . dahlias are in season here on the island too. You can find them on road-side stands or you can cut them yourself on a sunny summer afternoon. 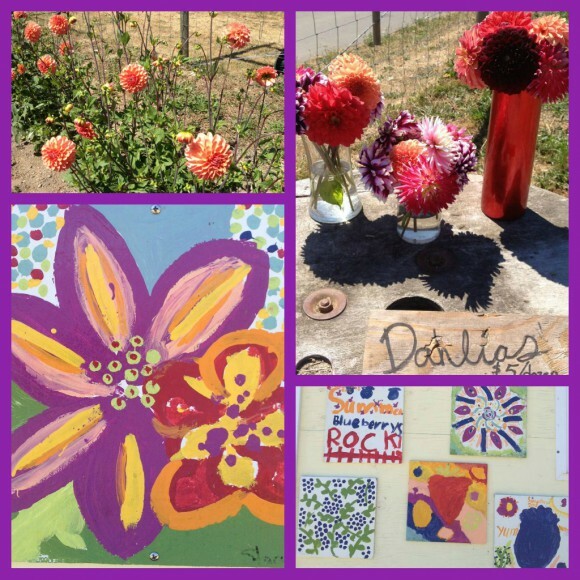 That’s what we did yesterday at Bainbridge Island Blueberry Co. My dahlias are not in bloom yet in my garden, so we enjoyed cutting three dozen yesterday to fill our house. Only $5 a dozen. In the orchard next door to the dahlias the blueberries are ripening away in the sun. They should be ripe by early August (2013). Can’t wait for more berry picking. This weekend we went berry picking. 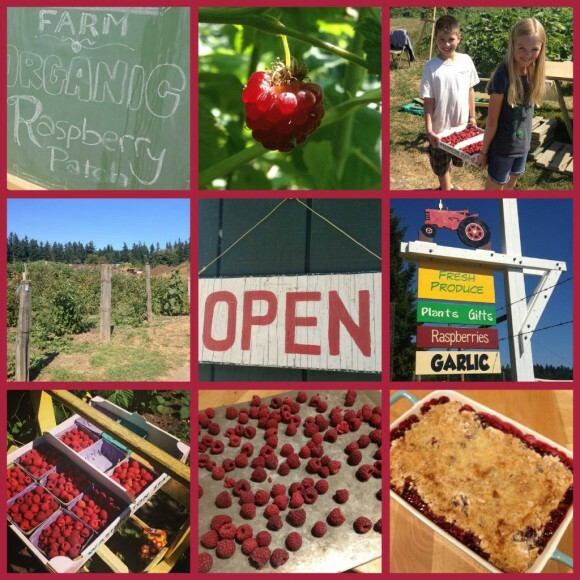 Raspberries are in season at Suyematsu Farms on Day Road. The season is short. They estimated 2-3 more weeks (as of June 21, 2013) so don’t delay. The berries are organic and the prices are great. We got an entire flat and it cost us @ $13. I flash froze some for berry muffins and smoothies. And, last night we made a berry crisp – Willie’s Crisp – an old childhood recipe from the SF Chronicle. In case you need a great, and easy, crisp recipe. 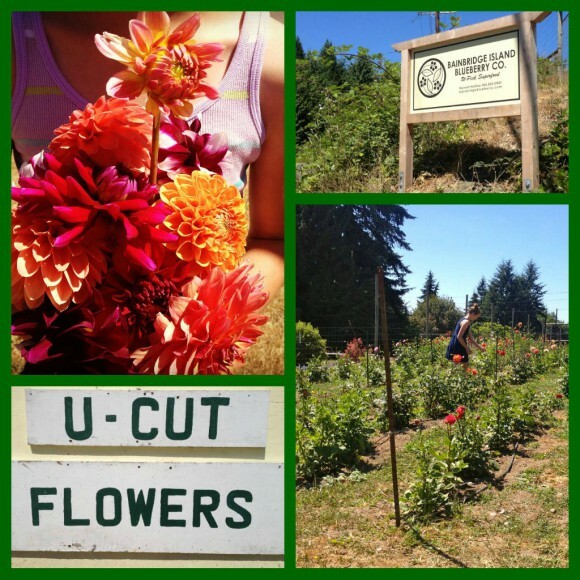 About the time the raspberries are out of season, blueberries will be in season right down the road at Bainbridge Island Blueberry Co. On the corner of Madison Ave and Valley, the farm has u-pick blueberries and u-cut flowers (dahlias ;). And soon after the blueberries arrive, blackberries will abound throughout the island. For FREE. They usually ripen first on the south end at Fort Ward Park and they are bountiful at Battle Point Park too. Blackberries are my fave and I think they are the best berry in my most favorite blackberry muffin recipe. So, summer is in full swing. We are having an amazingly warm and sunny one here on the island. A little photo-essay of what it has looked like so far, in my little world. Campfires on the beach. Pleasant Beach in this shot. Blackberry anticipation. Here’s how they looked yesterday in Fort Ward Park. They usually ripen first down at sunny Fort Ward. Lots of ferry riding for us this summer for softball and soccer tournaments, we have enjoyed watching the sun set on the 9pm boat. Softball Allstars were what we lived and breathed for June and July, for both girls. Warm weather horse riding is the best. 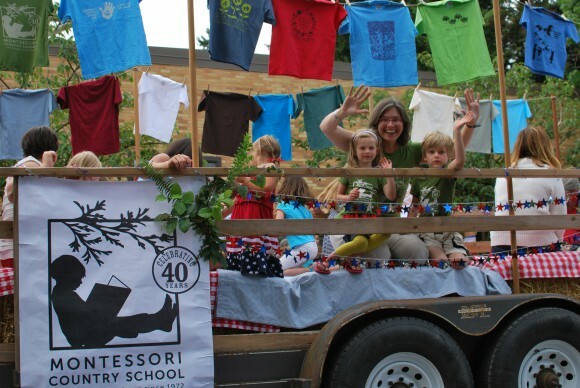 The 4th of July Parade on Bainbridge is a tradition we have not missed once since we have lived here. The Rotary Auction . . . another summer tradition. The Great Wheel in Seattle. We rode it for the first time last week. 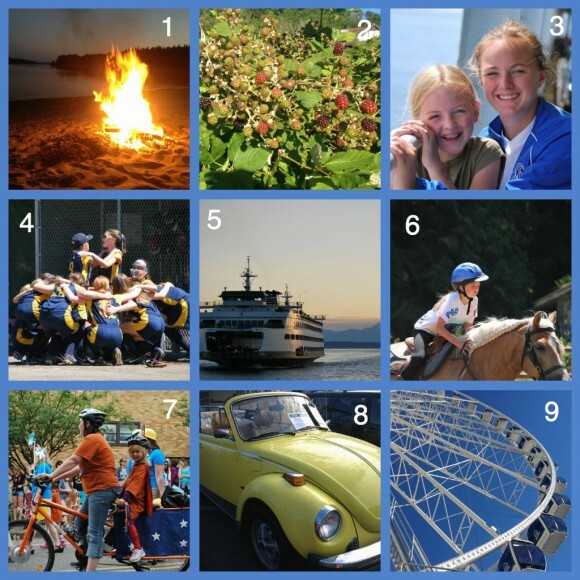 A fun way to take in all the Seattle and Puget Sound sights in the summer. The Bainbridge Island Ferry from Seattle. Summer 2013. The good news is we are seeing more activity in the over $800K segment. At the end of the first quarter, we were at par with the number of sales between $800-$1M from 2012 and 2013. Now at the end of the second quarter, we are up 50% in that price range. Of the four sales over $1.5M this year, three occurred in the second quarter. With all that being said, the rest of the market is doing quite well. In the first half of 2012, the Median Cumulative Days on Market of sold homes priced between $0 and $700K was 75 days; this year, it was only 22 days. 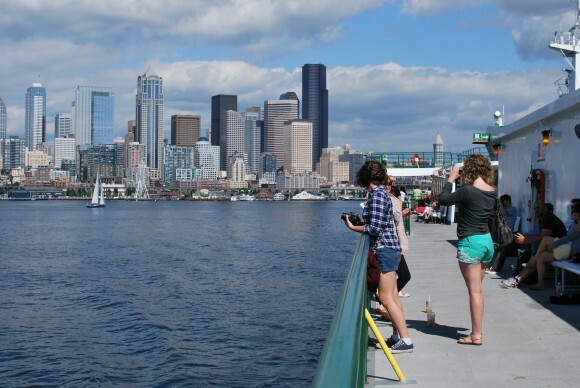 We are not experiencing the quantity of multiple offers as our neighbor, Seattle, but they are not uncommon. It is extremely difficult to calculate price movement within price ranges, but we can say with confidence that prices have stabilized and are beginning to move up with properties that are getting a lot of attention. In many regards, the condominium marketplace is experiencing similar conditions. There have been 40 condominium sales in the first six months of this year. This is up 17.6% from last year and 66.7% from the market low of 24 in 2009 (but still way shy of the peak of 93 sales in the first half of 2004). Of the 40 condos sold, only one went for a price above $600K and only four above $500K. This is a mere 10% of sales compared to 40% of the 80 sales in 2007 that were above $500K (32 sold above $500K and 20 sold above $600K). It is no wonder the median price of condominiums sold this year is $318,500 versus $468,125 in 2007 (down 32%). Part of the problem may be that there are only seven listings over $600K. The good news, though, is that two of those seven are under contract as of this writing. There appears to be more life in the upper end of the condominium marketplace, but we need more results to be able to say so definitively. Fort Ward on Bainbridge Island. Spring 2013. 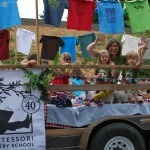 4th of July on Bainbridge Island. July 2013. Even with our market’s renewed vigor, we could use a bit more balance. There is positive movement in our more expensive homes and condominiums, but in general the people who are in that segment are frustrated by the slowness of the recovery. Buyers are battling with a lack of inventory and choices while sellers are looking for better prices before committing to sell. We will get there; it just may take a little more time. We have been steadily improving since 2010 in terms of homes sold, so as long as there are sales and demand, prices will strengthen and improve. 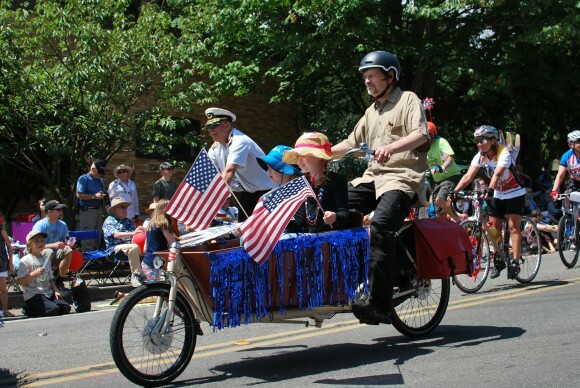 Annual 4th of July Parade on Bainbridge Island. July 2013. 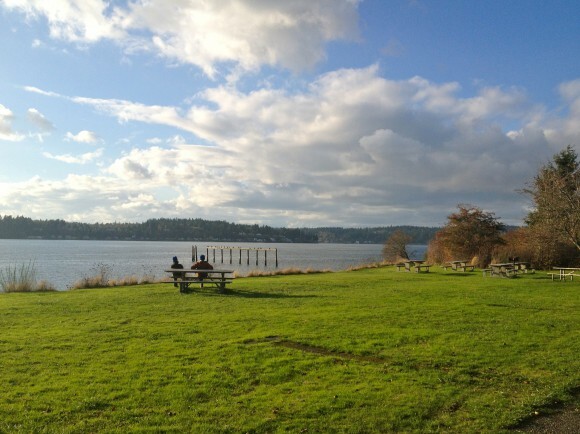 What never changes is Bainbridge Island’s distinct character. We are a unique community, where people want to live. Where else can a Rotary Auction gross over $440,000 in six hours? The net proceeds will be recycled back primarily into our community’s non-profits, schools and students (1/6th of the proceeds go to international programs like ending polio and water wells in Uganda).